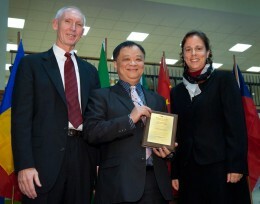 Interim Provost Thomas Sudkamp, Ph.D., and UCIE Director Michelle Streeter-Ferrari presented George Huang, Ph.D., with the 2012 International Education Award. For his tireless efforts to expose the Wright State community to global cultures and research, George Huang, Ph.D., is this year’s recipient of the university’s International Education Award. The Wright State University Center for International Education (UCIE) presented the 11th annual award as part of the university’s International Education Week festivities. The International Education Award is designed to recognize the successful efforts of members of the Wright State community in expanding global awareness and international understanding on campus and in the surrounding communities. It highlights innovations in curriculum development, the operation of study abroad activities and the provision of services to students and scholars. Huang joined Wright State in 2006 as a professor and the chair of the Department of Mechanical and Materials Engineering. He also spearheaded the research and development of micro air vehicles, serving as the founding director of Wright State’s Ohio Center of Excellence in Micro Air Vehicle Research. Huang has been a vital force in globalizing the university’s curriculum, especially within the College of Engineering and Computer Science. He initiated the International Industrial/Academic Leadership Experience Ambassador Program, a three-week program that has been conducted every summer since 2007. This program, in close collaboration with Chung Yuan Christian University in Taiwan, has hosted students from three colleges at Wright State: the College of Engineering and Computer Science, the Raj Soin College of Business and the College of Liberal Arts. He was also crucial to the establishment of the Center for High Performance Computing, a joint collaboration between Wright State and Cradle, a Japanese computational fluid dynamics firm. The center has provided numerous opportunities for undergraduate and graduate students to conduct cutting-edge research and to be exposed to Japanese culture and business practices. Huang also uses his international connections to support faculty and student scholars traveling abroad. “Throughout my time in Taipei, the mere mention of George Huang’s name not only opened doors, but was met with the most graciously warm recognition of Dr. Huang’s warmth, friendliness and top-notch scholarship,” said Luehrmann. Even Huang’s educational background is a global affair; he earned his bachelor’s degree in Taiwan, his master’s in Canada and his doctorate in the United Kingdom.